Everyone knows that car window tinting keeps you cooler and adds to privacy and security… but did you know these great advantages are even bigger when it comes to your business? 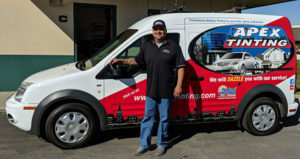 Whether you have a small or large business, window tinting will make a big difference. Retail store fronts, medical and dental buildings, schools, and every other office or business will be happier with window tinting by Apex. Commercial window tinting is our specialty, and we have years of experience too! Countless building owners, store and office managers have chosen Apex for their window tinting solution. 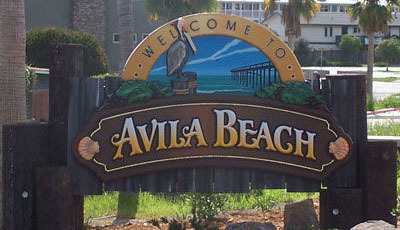 Your Avila Beach business can benefit as well, give Apex a call today! Most buildings these days have a lot of windows for light and aesthetics. They look great but come with a host of concerns as well. Those windows attract and absorb the suns rays. Not only can this be uncomfortable it also raises your utility bills. Guess what – you can reduce that solar heat by about 70% with Apex window film installed. Not only will it be more comfortable it save you money too! The other big consideration is glare. In some settings the sunlight can really make computer screens difficult to see. This causes eye strain and can make errors happen more frequently. Sometimes businesses will install drapes or blinds as a way to keep out the glare and heat. This can help, but is not as adequate at heat reduction and it limits visibility. Apex window tinting is a better way to go! Our window film is professionally installed by Apex experts! Windows can be broken into easily especially if they do not have the added protection of window film. Windows with security film are less desirable to thieves and vandals. Security film makes it harder to shatter and slows down the attempted intruder, every second counts when waiting for help to arrive! They also don’t like to enter into a window that they can’t see through, because they don’t know what could be waiting for them inside! We have a great selection of films for tinting your windows, they range from 4 mil to 18 mil We also provide anchoring systems to strengthen and bind the security films. Graffiti guard window films are another option Apex offers. It is applied to windows exteriors, so when the glass gets defaced or tagged, the layer of film can be easily be replaced. This saves money over having to replace or resurface the glass. Storefronts usually have large glass windows. These are great for a lot of businesses. Providing good visibility of what is being displayed and what is inside. Unfortunately those large windows let lots of UV rays in, which really damage merchandise and increase the discomfort inside. At certain times of day the sun can cause so much glare that employees can’t see their register screens and customers are irritated. This glare affects the error ratio and can cause eye strain. Not only will window tinting film reduce the glare, it will make it a much more comfortable temperature inside. Those who pay the bills know that helping your A/C unit not have to work as hard will prolong its life and keep energy bills way down! Government buildings and Law offices, medical and dental offices, and schools all benefit from professionally installed window tinting film. Solar film installed by Apex will increase inside comfort and will decrease energy costs. And for many of these kinds of locations security and privacy are the most important aspects. Apex window tinting will have a perfect solution. Think about all of the sensitive material in a lawyers office or government building, not to mention the privacy requirements for the patients of medical and dental offices. Schools need to consider the safety of the students and staff, while also providing an adequate view to the outside. Our wide array of window films at Apex include choices such as one-way, frost, opaque, and decorative. Our professionals will take into consideration the specific needs of each location and provide the best solution for each window. Think these are some good reasons to have window tinting in your home as well as your business? Do not fear Apex also does residential window tinting!